A backhoe is a piece of heavy machinery that has a primary purpose of moving earth. They are usually mounted on either a regular diesel tractor or on a front-loader, the latter giving it the ability to move dirt in two ways. 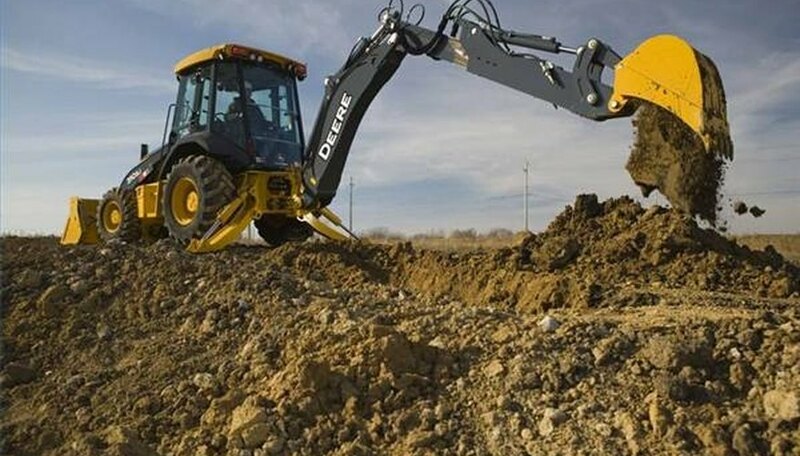 A typical backhoe is used to dig trenches and ditches at construction sites. A backhoe has a bucket for digging on the end of a two-piece arm that is maneuvered by hydraulics. The portion of the arm that is closest to the tractor or front loader is known as the "boom," while the section to which the digging bucket is attached to is called the "dipper." The entire assembly is connected to the tractor by a pivot joint called a "kingpost," which lets the arm move to the left or to the right. The bucket itself is equipped with a number of "teeth" that allow it to dig into the ground. The backhoe came into being in 1953 when Joseph Cyril Bamford, the founder of a British company called J.C. Bamford, attached the arm assembly to a tractor that had a front-mounted loading bucket. The company was called JCB and soon the backhoes they began to produce were simply called JCBs in England and Ireland. By 1964, JCB had sold over 3,000 backhoes, and the backhoe became very popular at construction sites in America shortly after that. A backhoe is a versatile piece of equipment and can perform many jobs, especially if it equipped with a front loader. Landscaping jobs that are not too extensive can be handled solely by a backhoe. It is used to dig trenches for a number of projects, including laying pipes, cables and foundations. A backhoe can be used to excavate dirt and drop it into a truck for quick removal. It is also a useful machine for moving snow. A backhoe can be driven to a job site on its own and does not need to be towed, which is one of its benefits. Backhoes also have the ability to clean up a construction site, moving large piles of dirt around and smoothing them out with the bucket. A backhoe also can remove roots of trees that have gone down deep in the ground. It can travel over many types of terrain, allowing it access to spots that other machines cannot get to. A backhoe can also pat down loose soil, and there are attachments that can go a backhoe to perform tasks such as digging post holes and planting trees. The operator of a backhoe controls the movements of the bucket and arm with levers. The seat of a backhoe can swivel to face the rear of the tractor's cab where the backhoe is mounted. Two metal "feet" will come down, one on each side of the tractor, to provide leverage for the machine. One of the levers extends the whole arm of the backhoe while another will bend the arm, allowing it to touch the ground where the hole is to be dug. Yet another lever will then force the bucket into the dirt. Once the bucket is full the arm will be raised up and the bucket swung over to one side of the hole to dump its contents. The hydraulic system gives the backhoe the ability to move great amounts of material at once, doing the work of many men in a much shorter period of time.